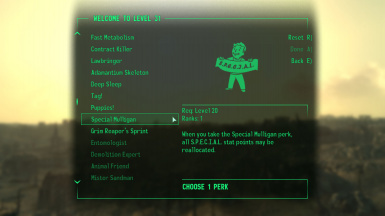 Increases the player max level cap to 40 and spreads out perks to accommodate the change in a balanced way. Some broken perks have been patched such as Nuclear Anomaly and some useless perks have been tweaked to make them useful such as Deep Sleep. Check description from update changes. This mod changes the players level cap, balances perks to accommodate for the increased level cap, and tweaks some of the more useless perks to make them worth selecting in a balanced way. 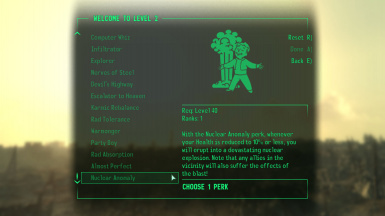 Some perk bugs have been patched such as Nuclear Anomaly. ﻿Please Endorse if you enjoy the mod. The max player level is now raised to 40. You must have Broken Steel installed. 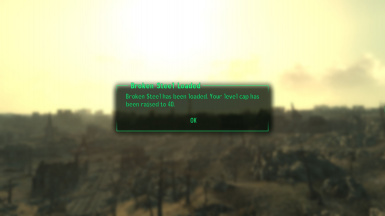 When the player leaves the vault for the first time you will be prompted that Broken Steel has been installed like in vanilla but the level cap will read 40. 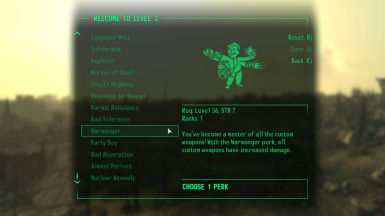 There is no way to pick more then one perk per level, so increasing the level cap is the only way to effectively give more perks. This mod gives the player an added 10 perk choices. ﻿*This perk was pretty useless in vanilla as 5 skill points over a perk in 3 ranks is ridiculous. ﻿- Intense Training: This perk is now only 5 ranks. ﻿*Still a pretty useless perk. Should only use if you messed up your S.P.E.C.I.A.L stats at the start of the game. ﻿- Little Leaguer: This perk is now 1 rank granting a bonus of 10 skill points in Melee and Explosives. 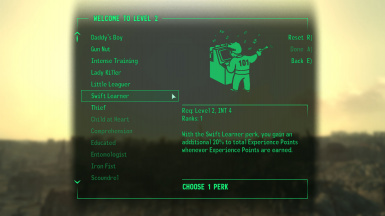 ﻿- Swift Learner: This perk is now 1 rank granting a bonus of 20% bonus XP whenever XP is earned. ﻿*This perk was pretty useless in vanilla because the level cap was very low. A little more useful now. ﻿- Thief: This perk is now 1 rank granting a bonus of 10 skill points in Sneak and Lockpick. ﻿- Scoundrel: This perk is now 1 rank granting a bonus of 10 skill points in Speech and Barter. ﻿it makes the player more effective in combat for 8 in game hours. ﻿*Not sure why this was level 22 on vanilla with a level cap of 30. ﻿*No Weakness was one of the most useless perks in the game considering Almost Perfect is in the game. ﻿*Even though it says there are no requirements in game, this perk requires 70 or greater Science. It's a bug in the game engine. ﻿*Leveling becomes longer at this point. Seemed like a good place to put this but still a waste of a perk. ﻿*Moved here because I felt the players needed more time before considering taking this perk to maximize its effectiveness. ﻿*Since this is considered an end game perk, it needed to be put much higher on the list. ﻿by 20% for all custom weapons. ﻿*This was a terrible perk in vanilla because by the time you level up to level 26 to get it you more then likely already have all the schematics. ﻿*I hate this perk as it makes so many other things in the game obsolete. ﻿Modified the Nuclear Anomaly perk script to prevent the player from being killed in the explosion on higher difficulties. Nuclear Anomaly now activates at 10% health instead of at 20 health which was WAY to low for higher difficulties. Description also reflects the change. Nuclear Anomaly no longer heals 9999 rads and has been changed to heal 50 rads. Nuclear Anomaly no longer factors Damage Resistance when healing the offset. I've added a new formula to heal the player and after extensive testing it seems the player is now incapable of being killed by the blast but can still be killed by enemies if you don't heal. The reset timer for the explosion has been changed to every 30 seconds from every 10 seconds. 10 second blasts was overkill and it was also annoying to keep exploding over and over again especially if you didn't hit anything. ﻿*There is a major bug with Nuclear Anomaly in where the blast will just outright fail to hit anything including the player. This is due to some bug with the ﻿game engine. The perk will also randomly heal the player significantly more then what is programmed for unknown reasons. This bug is also in vanilla but at least the perk is no longer completely useless. Tweaked Cannibal perk to heal the player by 75 health instead of 25 health to make it worthwhile. Deep Sleep has been moved from level 20 to level 16 so players can take advantage of the 10% XP boost sooner. Deep Sleep now grants a Very Well Rested bonus to players who take the perk. Deep Sleep still gives 10% XP but also gives 5% damage with all weapons, 5% critical chance, 5% critical damage, and 15% improved hit chance for eight in-game hours. You can still get the Well Rested perk but only if you sleep in an owned bed without this perk as it was in vanilla. No Weakness has been renamed Special Mulligan and no longer raises SPECIAL stats lower then 5 to 5. Special Mulligan now allows the player to reallocate SPECIAL points. A menu will appear after selecting the perk which allows the player to reallocate SPECIAL points. This occurs only once after selecting the perk. Almost Perfect was programmed to raise SPECIAL stats to 9 if the stat was 9 and lower. The keyword used was the mod keyword which raises the stat to 9 and cannot be lowered and causes the item Lucky 8 Ball to reduce Luck by 1. This is because Bethesda coded the SPECIAL point system using some sort of negative number algorithm for some reason. I have changed the old formula and added a basic math formula to calculate raising the players SPECIAL stats without using the mod keyword. This fixes the Lucky 8 Ball lowering Luck by 1. ﻿*The Lucky 8 Ball bug persists to raise Luck by 1 if you are holding the Lucky 8 Ball while taking this perk. You should use Updated Unofficial Fallout 3 Patch to fix this bug. 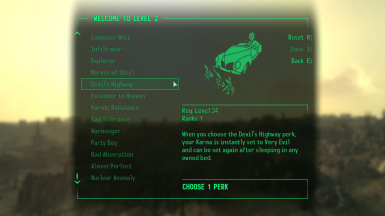 Changed Devil's Highway, Karmic Rebalance, and Escalator to Heaven to grant the player the ability to reuse the perk anytime the player sleeps in an owned bed. The perk descriptions reflect the change. 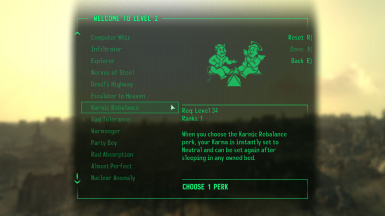 After taking one or all three of these perks, a menu will appear when activating a owned bed asking if you will like to re balance your karma before you sleep. You do not have to re balance karma every time you sleep. Just choose the "Sleep" option. 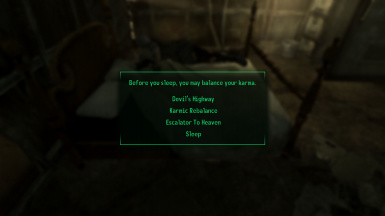 Karma will only be given if the player actually sleeps after selecting one of the options. 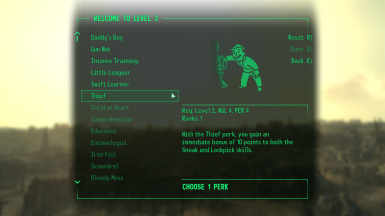 The options will only show the perk(s) you have chosen. If you can't select one of the perks when you are at the appropriate level, it is because your karma already matches what the perk will take you to. For example, if you are at neutral karma you will not be able to select Karmic Rebalance. The developers intended this to happen so you don't choose a perk you can't use. All updates have been thoroughly and painstakingly bug tested using the Updated Unofficial Fallout 3 Patch and are guaranteed to work. Installing other mods that also tweak the same functions or scripts could possibly break functionality. If you do not use the Unofficial Patch (You should be though) then please let me know if you want a standalone version of this mod. The only bug I am aware of without using the Unofficial Patch in the Level and Perks Balance mod is the Lucky 8 Ball bug. As a modder I promise never to release a patch without thorough bug testing, but sometimes bugs still occur due to unforeseen circumstances. If you experience a bug, please test this mod without other mods before posting bug reports. I will fix bugs as quickly as possible. It is also important to post bug reports as soon as possible as close to the current version release date as possible. Please make any requests on how to balance perks out and change useless perks into something useful that keeps in line with the feel of vanilla!